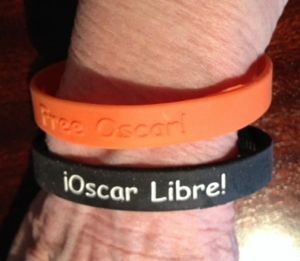 After 32 years, it’s time: Oscar Libre! Free Oscar! bracelets. Photo by Nancy Bishop. The important name not mentioned was Oscar Lopez Rivera. Several commenters to the article did mention his case and I wrote a correction message to the editor, but HuffPost has not responded. It happened that the day I read this I had just returned from the annual National Boricua Human Rights Network pancake breakfast, held every December at Casa Puertorriqueña to raise funds for Oscar Lopez Rivera and to generate support for his release. Each year, we write notes on Christmas cards for Oscar, hoping that next year he will celebrate the holiday at home with his family. And we sign petitions to President Obama, requesting that he consider Oscar’s case and release him. Lopez Rivera, now 70, is in federal prison in Terre Haute, Indiana. He has been imprisoned for 32 years for sedition. He was never charged with causing harm to persons or property, just for planning and organizing in favor of Puerto Rican independence. A longer serving US political prisoner is Native American activist Leonard Peltier, who is serving two life sentences for the 1975 execution-style deaths of two FBI agents. Peltier has maintained that he was framed by the FBI and has appealed his conviction several times but has been denied. The 68-year-old was last denied parole in 2009 and won’t be eligible again until 2024. And then there’s Guantanamo, where we’ve held more than 150 political prisoners for 12 years. As Nicholas Kristof commented recently, “There is a whiff of hypocrisy about the adulation for Mandela even as we simultaneously sell weapons to repressive regimes around the world.” And hold political prisoners unjustly within our own borders. Nancy: It is an important entry in your wonderful journal and I join in supporting the other prisoners left out of the news, but not left out entirely, because of you. Thanks, Joan. The situation of these political prisoners is inexcusable. Obama would lose no political capital by pardoning Oscar. We have to generate more noise about it, I believe.